Explaining the "Why to do" as well as the "How to do"
Understand the cream soap making process and the ingredients before making a costly mistake. This proactive approach is in stark contrast to the reactive approach that current cream soap makers employ: asking questions in forums. You've heard everyone talking about it and you have seen the pictures in the forums of this amazing product. Curious you've caught the bug and now want to make some yourself to see what all the hype is about. Great! But the learning curve is too steep! So much demands your attention already so the time, and the inclination, to wade through thousands of posts scattered over several different online forums in order to figure it all out by yourself just doesn't exist. It will take months and months to read everything available on the internet and then even more time to organise your notes into something that can be worked from. The Cream Soap Naturally, PDF eBook will get you up to speed with the latest cream soap methods. Fast! The Cream Soap Naturally book contains everything you need to know in order to successfully make cream soap from raw ingredients. Let this book teach you how to correctly and successfully formulate your own recipes without the costly mistakes of trial and error. Ensure that you have a solid foundation of how the cream soap making procedure works and the wide array of varied pathways to successful end results. Build up your confidence to formulate your own recipes as you work through the different possibilities and options cream soap offers. Practical, real-world examples and ideas allow you to determine your own soap making needs and product demands. Now you can get formulating and making cream soap in no time by buying this book. Written with the soap making hobbyist in mind with very little to intermediate soap making knowledge. Chapter 4, Formulating, delves into the details of how to calculate your own formulas, explaining the math behind cream soap calculators acting as a must have reference guide and companion to the Making Cream Soap book written by Catherine Failor. Join the growing number of cream soap makers enjoying the freedom and control of making cream soap with confidence. Get the only book that tells you "Why-to-do" instead of just "How-to-do"! Dangers of Phenolphthalein and safe usage instructions. Understanding the procedure and the steps involved in cream soap making. Cooking procedure and it's stages. Additional liquids, preserving, rot phase, additives. Calculate lye amounts using percentages. Calculate using fixed ratios to determine lye amounts. What makes desirable shaving cream and what doesn't. Using chelating agents and why they are important to cream soap. 3 easy recipes included to get you started. Troubleshooting guide to help you avoid common pitfalls and to help you figure out what went wrong if it does. 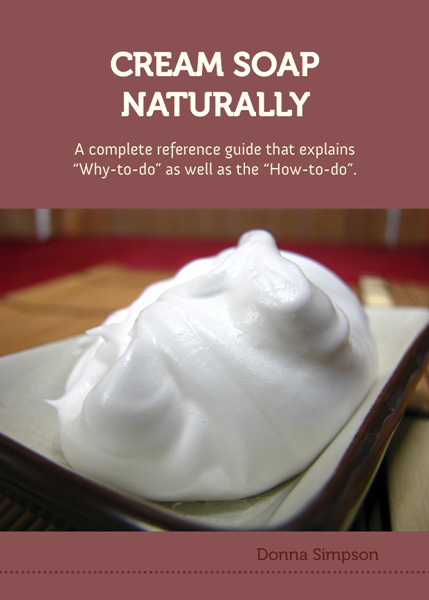 The Cream Soap Naturally book has a complete bookmarked Table of Contents to the content located deep in the book plus it has a complete Index to help you find what you want quickly. The PDF will be stamped with the buyer's name and email address to discourage piracy. The PDF will be sent to a customer's email inbox within 36 hours. Do ensure there is at least 5 MB of free space for your inbox. Note: Currently, we accept payment only via PayPal. For those who have never used PayPal, rest assured you can still use your credit card to make your purchase securely without needing a Paypal account. Sorry, we do not accept personal checks or echeck as a payment method. Only money orders or cashiers checks can be accepted. Find out why there are no refunds.